An exploration of colonial systems and mindsets which burdens India. I sometimes wonder about the colour coding of currency: why legitimate money is ‘white’ money and illegitimately acquired money is ‘black’ money, even though we Indians are legitimately brown and black, and the colonizing chaps who came here as thieves and robbers were ‘white’! But this blog is not about racial language. What I would like to ask readers is that while there is so much noise about Black money, how come so little has been said about White economics? Because Black money is not so much our problem, fundamentally, as is White economics. By White economics, I am referring to the ways of business as it has evolved among European colonisers, which is now being globalised. The basics of White economics are that it is: debt-driven, profit-driven, free-trade-driven, consumption-driven, and competition-driven. Since 1991, we in India too have followed and practiced White economics, and what is the result after 25 years of this experiment? 1) We are on the very edge of a debt trap. Did you know that India is borrowing only to repay interest on earlier loans? Our loans stand at over Rs 55 lakh crore, while government revenue is Rs 14 lakh crore (including income tax, excise, custom duties, etc.). About one-fourth of government revenue goes towards paying just the interest on loans. So the government borrows Rs 5 lakh crore more to meet its expenditure, which further increases the interest burden the following year. This has all the makings of a morbid debt trap. 2) Indian manufacturing is vanishing fast. Statistically, the contribution of manufacturing to GDP is a low 16 per cent. Realistically, we all know that our electronics, plastics, engineering items and much else is coming from abroad. Did you know that even cotton yarn and sarees are now coming from China, in this land of textiles! Our hugely diverse traditional small-scale industry has been killed by the profiteering mindset and free trade economics which has led to mere importing, trading, retailing and, of course, cheating. Imitating the English, we are becoming a nation of mere shop-keepers. 3) Unemployment in India is huge: 11 crore people, and growing fast, did you know this? One crore of these are graduates, post-graduates and technical degree holders, from towns and cities. And 7.3 crore in this list are non-literates and semi-literates, mostly from rural and semi-rural regions, showing the extent of catastrophe among the poor of the country. But what is more worrisome is the poverty of creative energy in society; our youth appear helpless and are merely begging for jobs, because the modern economic principles of centralized production and free trade of goods have killed the ideal of local entrepreneurship and self-sufficiency. 4) In the last 25 years, India has destroyed an enormous amount of its natural wealth – soil, forest, rivers, ground water and even the air. At the same time, we have generated an enormous amount of pollution, and caused climate distortion. A rush towards profligate consumption is wrecking havoc with our environment – we are meaninglessly converting rich natural resource into paper money and pollution (the actual resource, like iron, is mostly exported). But more important, what this does is to destroy the human in us, making us consumption addicts – just look at the desperate online shopping ads, they indicate how far down this road we have gone. This is the result of consumption-driven economics, which is clearly unsustainable. 5) A constant feeling of insecurity is an intrinsic part of White economics. One has to fight to get a job, and then to hold that job, or fight to stay in business, and to get ahead in life – it’s a struggle all the way. Such a mindset, a result of competition-driven economics, is destroying the social fabric of India. Did you know that, strangely, the so-called competition actually leads to oligarchic monopolies? But with the illusion of ‘choice’ ? Only a handful of companies remain in each sector – petroleum, computers, automobiles, soft drinks, confectionaries; one can investigate and see how only a few companies together own more than 80 per cent market share in each and every sector – and wherever globalization has happened, most of these are multi-national companies. 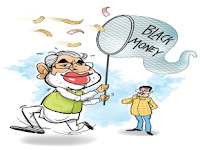 Black Money, or unaccounted currency, which is in the news nowadays, is only one symptom of the disease. There are many other easy-to-read symptoms, as mentioned above: Runaway Debt & Inflation, Collapsing Manufacturing, Continuous Trade Deficit, Massive Unemployment, etc. These are quantitative, technical symptoms. And then there are the more important, qualitative, human symptoms: Distress Migration, Farmers’ Suicides, Rapidly Growing Inequality, Destroyed Crafts Industries, Fragmenting Villages, Growing Insecurity, and Violence & Unhappiness in Society. But all these are, in the end, symptoms. To understand the disease, one must have a serious look at White Economics. This is the brown man's burden. Very well written. I hope we have many more major turnover steps coming up one by one. Thought provoking article! While on the economics front, I think its leadership has failed India. An example - India signed the WTO treaty in 1995 uncomprehendingly, without thinking of the impact on local manufacturing. Even after that, for years it retained reservations for small and hand-loom sector,thus preventing large scale manufacture of consumer goods in India, while Chinese goods made in large automatic factories, flooded the Indian market. As a quid pro quo, it did not even insist on a free market for services and still doesn't. By insisting on an open market for services and labour, India can start using its demography as a strength rather than a liability. I am a new farmer and an old writer-researcher trying to combine the two interests at a farm at Sawantwadi in southern Maharashtra, near Goa. Earlier, I ran the experimental Bodhshala School at SIDH, Mussoorie; it was a means of exploring, understanding, what is relevant education, and the havoc caused by modern schooling. Prior to that, I had the opportunity to observe the media closely, and I am keen to explore its relationship to distortions of modernity and the impending crisis of 'development'. The issues addressed are important, relevant and useful for us to be able to transform into a humane society; I approach them with that spirit of learning.